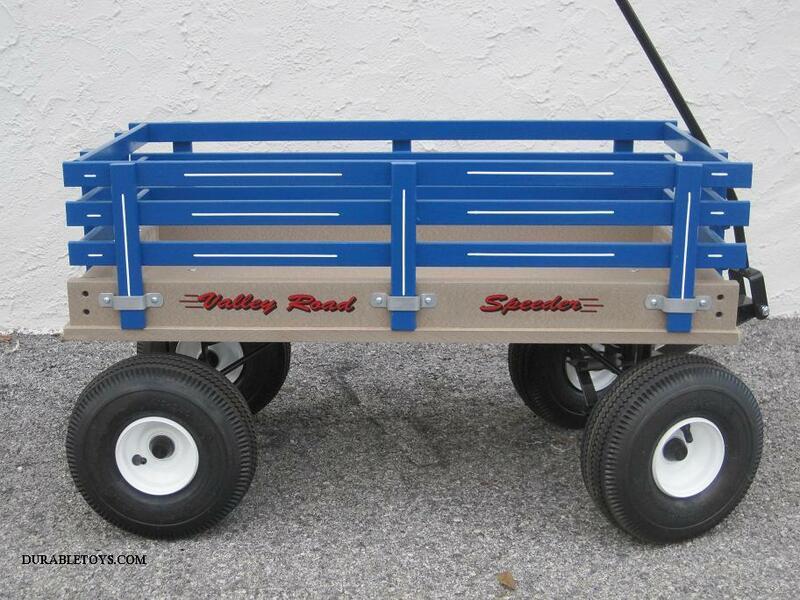 Valley Road Speeder Wagons are a colorful line Amish wooden wagons or Poly plastic wagons handcrafted in a small home workshop in Lancaster County with obvious regard for quality. "Poly" plastic wagon beds as a new option for most Valley Road wagon models. Unlike most plastic wagons on the market, these combine the water resistance of plastic with the charm and quality of Amish craftsmanship. Brightly painted solid wood wagon racks in classic red, green, blue, or pink. Multiple sizes, including small wagons for children, and large wagon models with adult-length 27" handles. Model 175 and up, or wagons 36" or longer, are considered adult sized. Inside bed dimensions are 3.25" shorter and 2.5" narrower than the official size listed. A variety of wagon accessories, such as stylish wagon seats, a removable wagon cooler rack, and a classic wagon canopy.